This originally appeared on The Princess Free Zone. Republished here with permission. Asking girls to always be clean, proper, and pretty sets up an unrealistic expectation that hurts their ability to play side-by-side with the boys. Here’s a news bulletin: Little girls sweat. Oh, and sometimes they even stink. Yep, they play hard and get dirty. Now, this may not be a surprise to some, but given the way we raise girls in a delicate princess culture that teaches how “little ladies” are expected to behave, or one that models femininity as they grow and develop in very specific ways, it is no surprise that it is often at odds with the idea that girls are just as active as boys. 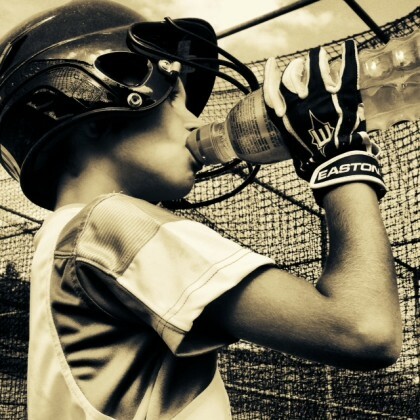 I took the above photo of my 8-year-old daughter taking a break after working hard at the batting cages. She plays baseball (loves to slide!) and would much rather be on a baseball diamond than almost anything else (…except maybe Minecraft!). But even though she is an accomplished athlete at this young age and can hold her own on any boys team, she still faces a certain amount of bias. Last year, during recess when she would play tag football with a few boys, she’d come home upset saying, “Mom, the boys won’t throw me the football! They think I can’t catch!” Finally, she intercepted a pass, but even after that they still hesitated to throw her the ball. What I find so gnawingly sad about these moments is that I know they creep into her psyche and undoubtedly have an effect on her. I know that she will have to prove herself over and over again by being better—not just as good, but better. And while she seems to be up for the fight (at least for now), I often wonder how many girls out there simply accept the stigma—that girls can’t play as good as boys, or girls don’t belong on a boys team—and give up. My friend and colleague Justine Siegal, whose organization Baseball for All is all about making baseball accessible to girls from an early age and beyond, has a good deal to say about this as she has made her way from playing the game as a young girl, pitching batting practice to MLB teams, coaching, and now mentoring. In her TedX talk, she points out that, according to Little League statistics, “approximately 100,000 girls play Little League baseball,” and yet “only 1,000 girls play high school baseball.” She then asks the obvious question: “What happens to the other 99,000 girls?” Are all 99,000 simply not good enough to play high school baseball? Is there not one in that entire group who cannot play as good as the most average male on any high school team? I, for one, do not believe that’s the case. But this is not just about baseball. Baseball is just a metaphor. It’s about life—a girl’s life. If we want girls to be and become leaders (which is central to Sheryl Sandberg’s message in Lean In), to be assertive and confident in their ability to run a boardroom, shouldn’t we lose the “little lady” talk? If we want boys to look at girls as equals—and not a princess that needs saving—shouldn’t we show them that real girls are gritty and actually don’t mind getting dirty? And, yes, that real girls sweat and sometimes it ain’t pretty. But shouldn’t life be about more than being pretty? Or sweet? Or hot? We can’t expect girls to head into college or the corporate world and suddenly slough off everything that we, as a culture and society, have taught them. The message that we put out to girls from birth needs to change. Asking girls to always be clean, proper and pretty sets up an unrealistic expectation that hurts their ability to play side-by-side with the boys. Which is why I say it’s OK to let ’em see ya sweat.